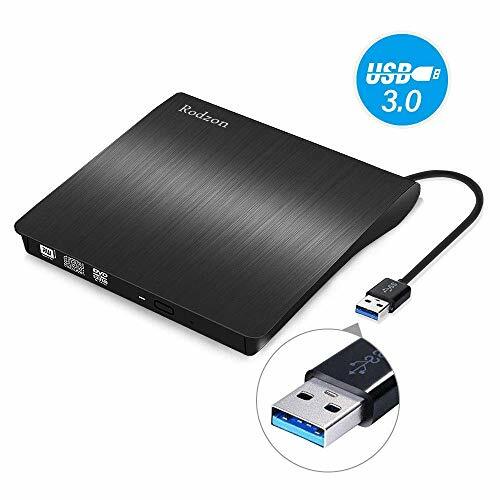 Rodzon External CD Drive, High Speed Portable CD DVD +/-RW Burner Writer CD ROM External CD DVD Drive for Laptop PC MacBook by Rodzon at Andy Pemberton. MPN: CDfba.8.1. Hurry! Limited time offer. Offer valid only while supplies last. 【Convenience】-The external DVD drive is powered by the USB port. Plug and play, no drivers need to be installed. Just insert it into your USB port and DVD drive. 【Compatibility】-It can be compatible with many types, such as Windows 2000 / XP / 2003 / Vista / 7 / 8 1/10, Linux and all versions of Mac OS; support any ultra wide band, netbook, desktop, laptop, tablet, Chromebook, notebook computer. 【High speed】-The RODZON CD/DVD driver is equipped with a USB 3 high speed interface that allows you to have faster data transmission speed (up to 5Gbps) and stable performance, with a strong fault tolerance. 【READ & BURN DVD】-You can read CD, VCD, SVD, CD-R, CD-RW, DVD-R/DVD-RW and burn CD-RW, CD+RW, DVD-RW, DVD+RW and so on. Use the SLIMCD CD/DVD driver, watch DVD movies, listen to CD music, or copy music, pictures, movies to CD/DVD, install floppy disks. Software, etc. 【Unique appearance and features】-Elegant, compact and stylish design; portable, can be taken on vacation or school; there is no noise, very quiet. The cable can be hidden behind the equipment and looks more beautiful. If you have any questions about this product by Rodzon, contact us by completing and submitting the form below. If you are looking for a specif part number, please include it with your message.